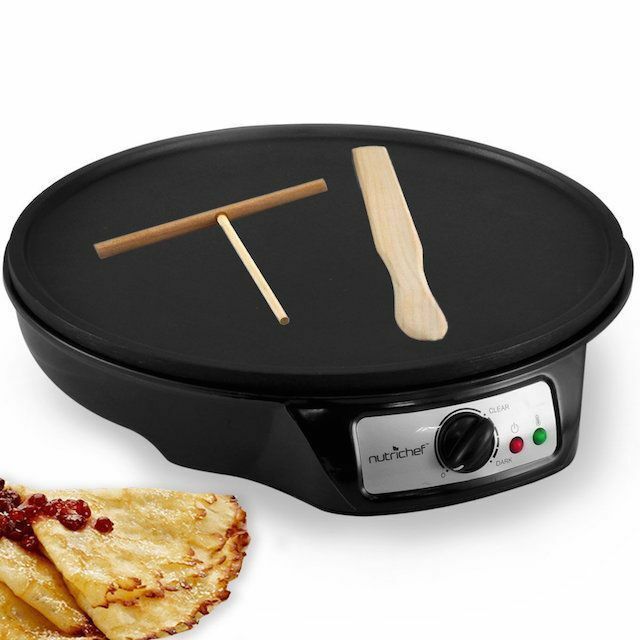 The NutriChef Electric Crepe Maker has a large, 12-inch cooking surface and a simple dial for temperature control to make the perfect crepes, but it can also be used as a griddle to make standard pancakes, fried eggs, bacon, or anything else you’d cook on a standard griddle. It’s also great for heating tortillas or flatbreads. The surface is nonstick aluminum that heats quickly and evenly. A wooden batter spreader and wooden spatula for making and handling crepes is included. The cooking surface has a very slight lip that helps keep juices and fats from dripping off during cooking, but it’s low enough so it doesn’t interfere with sliding a spatula under the crepes. This crepe pan is a traditional crepe pan design that works on any stove. It’s made from aluminized steel and has a nonstick surface so the crepes release easily and cleanup is easy – just hand wash with a mild detergent. The steel conducts heat well, so the super-thin crepes cook evenly. This 10-inch pan is large enough for standard or large crepes. It’s made in America, but has an imported handle. The sloped edge makes it easy for crepes to slide out of the pan without tearing, so you can make a large batch and stack them neatly. When you’re not making crepes, you can use the pan to cook eggs or hash browns, make omelets, or cook standard pancakes, but because of the slow sides, you won’t be using this to make stews or sauces. This crepe maker lets you dip the cooking surface into the batter – a batter tray is included – so you can let the excess drip off to create the thinnest crepes possible. Set the crepe maker down to finish the cooking. The cooking surface is 7 1/2 inches in diameter and has a nonstick surface so the crepes release easily and cleanup is just as simple, but you shouldn’t immerse it in water. To remove the crepes, just flip the cooker over, or use the included spatula. While this is designed for making crepes, you can also use it to fry an egg with the cooking surface upright. The cooker is cordless and gets its power from the base unit. Controls are simple – just and on-off switch and an indicator light. The power cord tucks away neatly for storage. Made from enameled cast iron with a traditional shape, the Le Creuset Enameled Cast-Iron Crepe Pan heats evenly and retains the heat to cook one crepe after another without pausing. The exterior is colorful enamel and the interior is a satin-finish black that will never need the seasoning that raw cast iron requires. It can be used on any stovetop and can also be used in the oven at any temperature. The handle is ergonomically designed so you can swirl the batter, but cast iron is always heavy, so it might be tiring for someone with hand or wrist issues. However, you could use a batter spreader while leaving the pan on the stove. When you’re not making crepes, you can use this on the stove to cook eggs, pancakes, or similar foods, or to heat tortillas or flatbreads. Use it in the oven to cook your personal-sized pizzas, too. If you like crepes, but don’t like them enough to want a dedicated cooker for them, this multi-use crepe maker will show up on your kitchen counter often. Not only can it be used for crepes and pancakes, but it has reversible plates so you can also make pizzelles. Then turn the pizzelles into ice cream cones with the included cone roller. Depending on what you’re cooking, this can be used in a closed position to cook the food on both sides at once, or open it flat to cook on two surfaces at the same time. It has dual knobs for controlling temperature and time, and an audible alarm. This has an 8 1/3-inch diameter nonstick cooking surface and includes a measuring spoon, tongs, and an ice cream cone roller. The lid locks closed for upright storage. The cooking plates are dishwasher safe but are simple to wash by hand. If you’re really serious about crepe making, you might want to upgrade to an electric crepe maker that’s more professional. This one offers a whopping 1000-watt heating element for fast heating and it has a 13-inch diameter surface for cooking regular or large crepes – or make two or three mini crepes. You can also use this for making pancakes or heating tortillas or flatbreads. 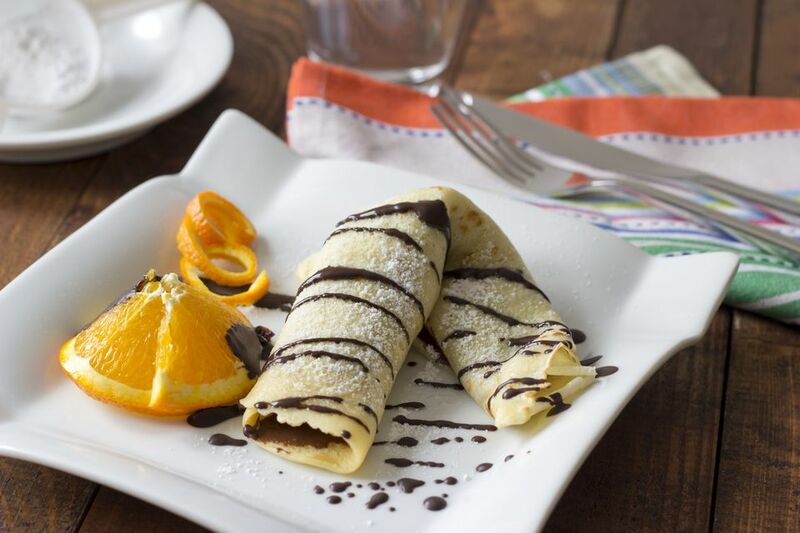 The nonstick coating releases the crepes easily and makes cleanup easy, too. There’s a temperature control knob to adjust the temperature for perfect cooking, whether you’re making crepes or eggs. A light indicates when the cooking surface has reached your desired temperature. Side handles make it easy to move or reposition. This includes a wooden batter spreader and spatula for making and handling the crepes. Since there is no lip around the cooking surface, you might not want to cook foods that would release liquid or fat during cooking, since it would drip off the edges.